Junior Surf Camp Activities – So Much to Do! Once you’ve finished your surf lessons for the day, you need not worry about getting bored! 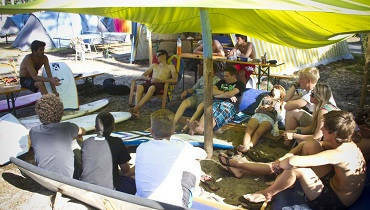 There is a wealth of activities to choose from to fill your non-surfing time with at our Junior Camp in Moliets. All you’ve got to decide is what to do first! If you’ve still got energy left after your surf lessons there is a football pitch, basketball, tennis and volleyball courts, and ping-pong tables too. What’s more, we’ve got our own mini-ramp for you to skate and a trampoline to bounce about on. 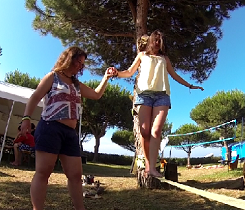 There are slacklines to practise your balance on and free daily yoga sessions to stretch out in. 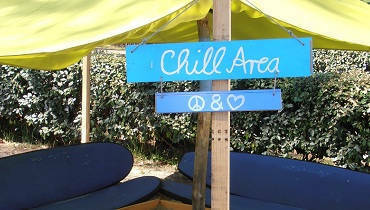 If you just want to chill out and relax then of course there’s the extensive sandy beach, or if you fancy some shade then sway in a hammock below the pines at camp. Alternatively, take a stroll into town, and check out the surf shops and cafes. In the evenings we’ve got a varied programme to keep you entertained. From karaoke nights, to team games, to movie screenings, to fancy dress, our team guarantee you’re not bored! Whether you come alone or as part of a group, you’ll certainly leave camp having made many new friends! Each week there are also day trips on offer too. If you’re 16 or older, you can join our San Sebastian trip. The Basque city of San Sebastian is a beautiful place to explore! Eat some delicious pintxos, watch the local talent surf on Zurriola beach, and browse the shops, before climbing up the hill to watch a stunning sunset. 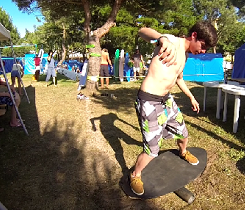 You can sign up to the San Sebastian trip in camp for 35€. We also offer trips to go paintballing or rock-climbing throughout the week too. 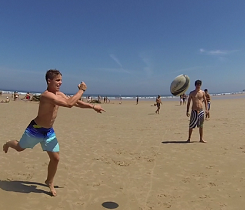 You most certainly won’t get bored at our Junior Surf Camp in Moliets!